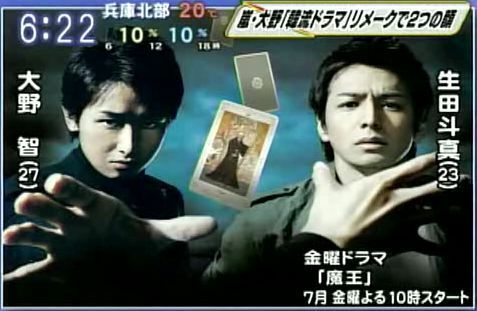 Catch rising JE boy Ikuta Toma and Arashi leader Satoshi Ohno at the upcoming suspense dorama titled “Maou”! “Maou” is a remake of the famous Korean suspense drama “The Devil” which was aired last year. Watch Ohno Satoshi as he acts as a two-faced lawyer, one that of a kindhearted soul and the other seeking to plot revenge on the murderer who killed his relative. Ikuta Toma will play the double lead role of the man, who has become a detective due to his dark past, who is pursuing the mysterious series of murders, fighting against the Devil. Ohno even reportedly ditched his dyed hair for a cool black, preparing himself for the role. Fridays @ 10pm (japan time) in July 08, I’m sure all Ikuta and Arashi fans, not forgetting the avid dorama lovers will anticipate how this will sweep them off their feet!